In the summertime (okay, actually, really, all the time) I am all about the steaks. I think my steak-deprived childhood has turned me into a steak fiend. But really, it’s hard not to love steak, especially when there are so many delicious ways to eat it. One particularly delicious way is in bún, a Vietnamese bowl of grilled meat, vermicelli and dipping sauce. This is by no means a traditional bowl, with the avocados and tomatoes, but it really, really works. 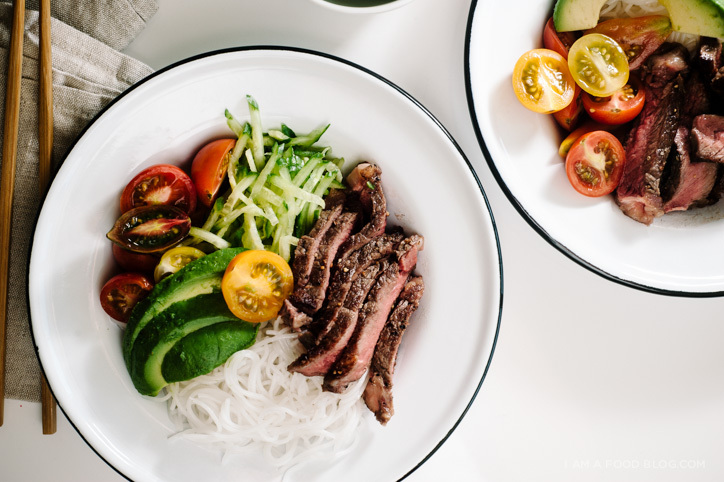 The sweet acidity of the tomatoes goes well with the steak and the creaminess of the avocados pairs nicely with the texture of the vermicelli. Dump a boat load of fish sauce on top and you are on your way to deliciousness. I didn’t marinate the steak at all, just because I think all a good piece of meat needs is salt and pepper. More traditional bún is usually made with thinly sliced meat that’s marinated, but steak was calling to me at the store. 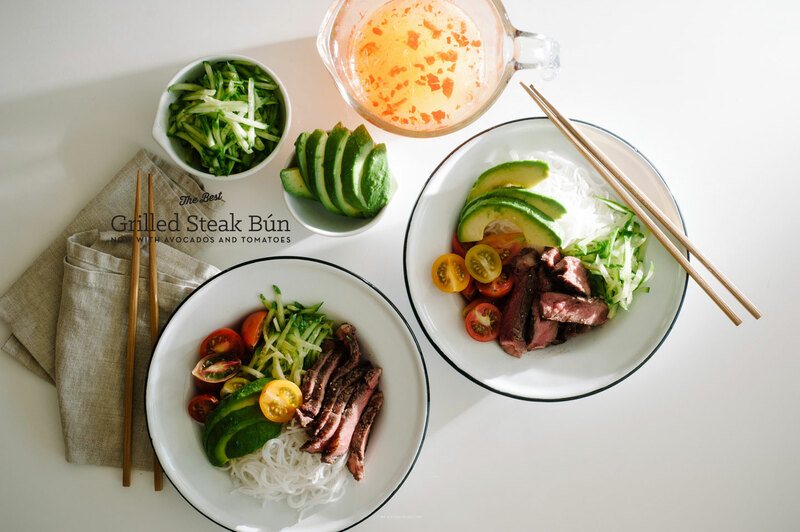 If you’re looking to fire up the grill (or cast iron pan) this weekend but want something just a wee bit different, give this steak and vermicelli bowl a go. If you’re anything like me, you won’t be disappointed! i am hot, i am cold: i am steak and vermicelli bun! 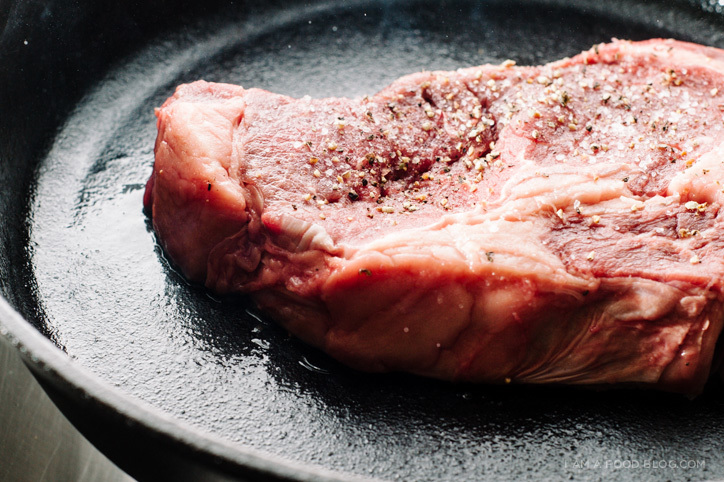 An hour before you want to eat, bring your steak to room temperature. When ready to cook, pat your steak dry with paper towels and generously season both sides of the steak with salt and pepper. Heat a cast iron pan on high until nearly smoking. Add a tiny slick of oil and place your steak in the middle of the pan and cook, without moving for 2-3 minutes. Flip and cook for another 2-3 minutes. Remove from the pan and let rest for 10 minutes while assembling your bowls. Cook the vermicelli according to the package, rinse in cold water and drain well. Divide amongst two bowls. Top with tomatoes, avocado and shredded cucumbers. 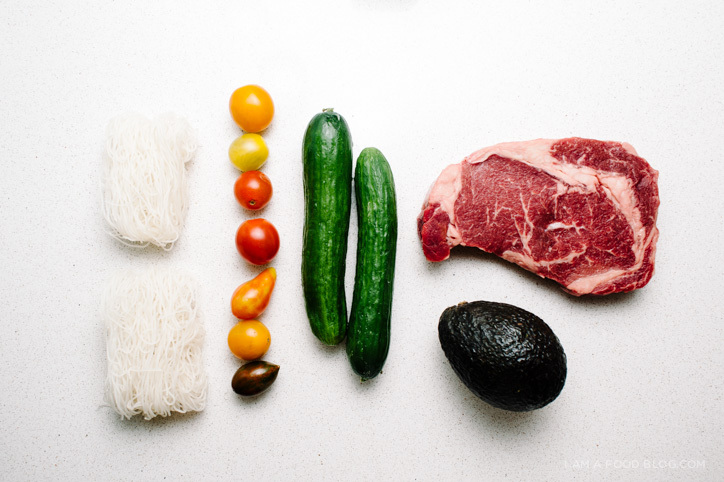 Cut the steak against the grain and arrange on the noodles. Serve with fish sauce, to taste. Crush the garlic, chili and sugar together in a mortar and pestle until the garlic and chili are crushed to tiny pieces and the sugar is spicy and fragrant. Dissolve the sugar, garlic and chili mixture with the water then add the lime juice. Mix well then add the fish sauce. It’s best to let the fish sauce sit in the fridge for a day or so for the flavors to meld before using. This looks AMAZING!! Definitely want to try this out – looks light but full of fresh flavours! Looks so delicious I want to try this immediately. Bookmarked and happening here soon, love everything about this!! YES STEAK. i’ve gotta get nick to eat more of it… and this is the prettiest supper in a bowl ever. i making up for all the uneaten steaks of my youth by eating as much steak as possible now. i’m pretty sure this is insanely unhealthy, but oh wells! the addition of the tomato + avocado is intriguing, definitely something i’d be down with trying compared to the usual bun thit nuong. i thought it would be a bit weird, but it turned out being AWESOME! I used to love eating this at home whenever my mom made it when I was growing up! This looks so delicious! this looks amaaazing. thanks for sharing! thank you so much cheyenne! OMG this actually made me drool a little bit. Gotta go grab lunch. Wish it was this. hahhah you have the BEST comments michelle! i was a bit iffy, but i gave it a go and it really worked! Yo, bun is like my favorite comfort food in the world – it’d be last meal for sure. Not that I’m planning on doing anything that would warrant me having a last meal… but you know, just in case. don’t worry josh, if it ever comes up…i got your back! last meal: bun! These are all my favorite flavors! Beautiful post. This look so good! Summer is the perfect season to enjoy some delicious, juicy meat, and this is such a great alternative way to serve it. We celebrated Midsummer yesterday and I barbecued picanha for the first time ever – hands down my favorite cut of beef. Seasoned with salt and pepper and served with grilled vegetables. Perfect. i’m so jealous of your super long days sini! 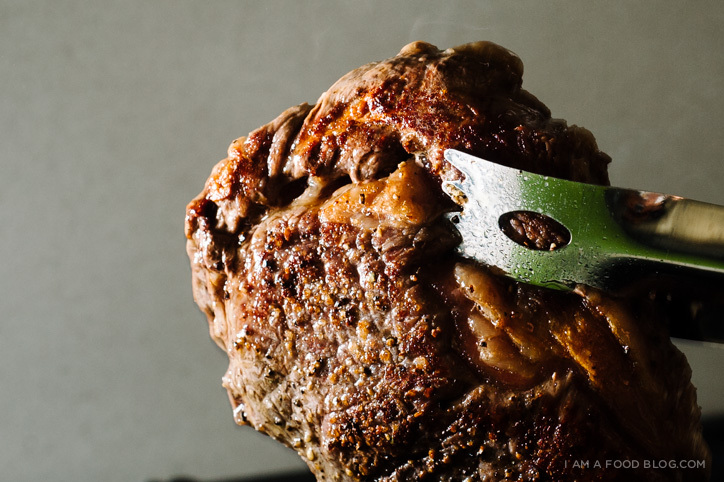 your picanha and grilled veggies sound so delicious! Yum! This sounds really delicious. I would like to incorporate more Asian ingredients into my cooking so this is definitely on my list! How spicy is the red bird’s eye chili? hmm, they’re quite spicy, but if you deseed them, not so much. 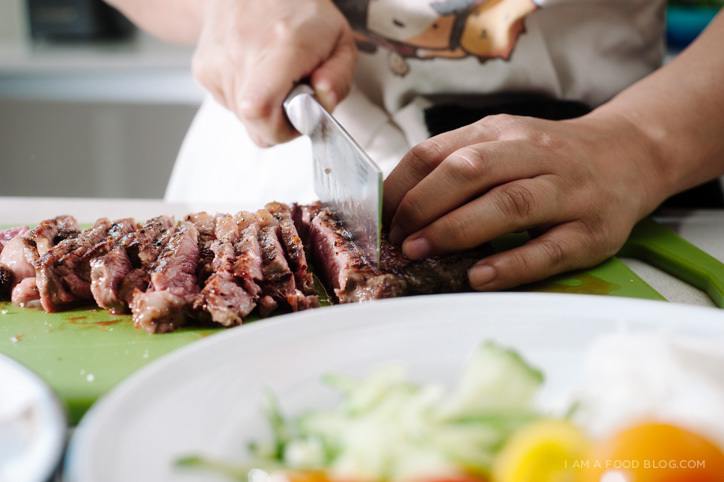 just be careful after slicing or deseeding – don’t rub your eyes. i did this once and it burned like crazy! Wasn’t deprived of steak as a child but we did eat ALL our steak very well done. Had no idea what I was missing out on until I was 15 and realized medium rare steaks were a whole different world. So now I think I am making up for all those shoe-leather steak I ate as a kid. Oh and avocado goes well with everything. EVERYTHING. Haha. I am not questioning whether that dish is tasty, it probably is. But the dish should not be described as Vietnamese. It is not. It does indeed include some of the ingredients that go into an authentic Vietnamese Bun noodle bowl, but that never makes a dish Vietnamese. Never in my life have I seen a Bun Thit Nuong bowl like this, and it cannot be called by that name. 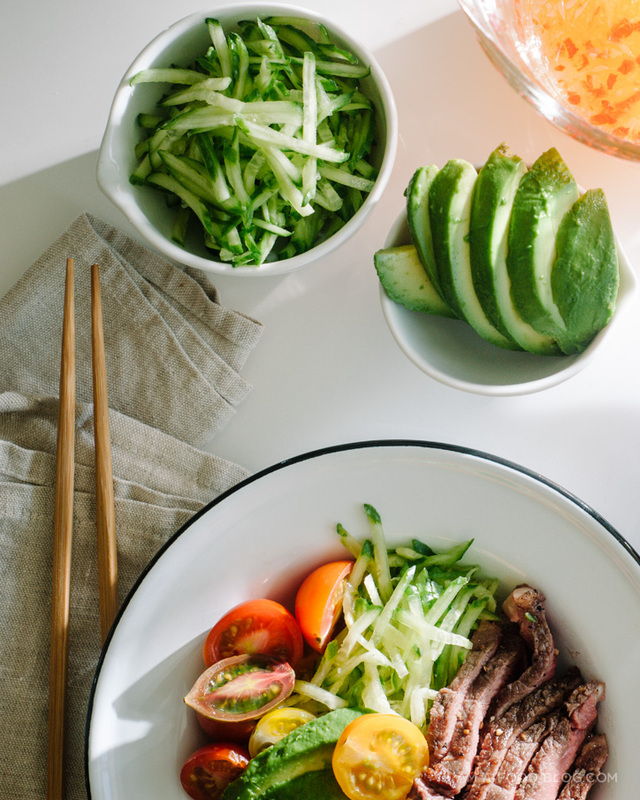 That dish is missing essential ingredients – where are all the VNese salad herbs, the bean sprouts, the pickles – and arbitrarily tosses in avocado and cherry tomatoes. And instead of the necessary marinated, deeply flavored, grilled proteins, meats or seafood or tofu, we get very plain pan-seared steak. I think it’s great when folks do riffs on their favorite Vietnamese dishes, all for that, encourage it every chance I get. But at the same time it’s quite WRONG for bloggers and cooks to mislabel and misidentify foods that are assuredly NOT Vietnamese. To some extent that may have been understandable in 1987, but it is not understandable in 2014. I am Vietnamese, born and raised in Hanoi, and I think it is perfectly fine for her to call in Vietnamese. Basically the main flavor profile is there – diverting from it by adding a few things or cutting a few things based on one’s own preference doesn’t un-Vietnamese it. Plus the herbs and bean sprouts and pickles are not “essential”. There’s a reason they are served separately on the table in Vietnam, so that people can customize. It look like beautiful. This steak cook medium or well done. This is great! 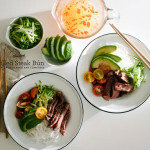 I am Vietnamese and I love seeing recipes that break away from the traditional. Never thought about adding avocados to bun though – will definitely try it. Thank you! Well, it’s time to cook by myself. Of course, this time, Vietnamese style!! !